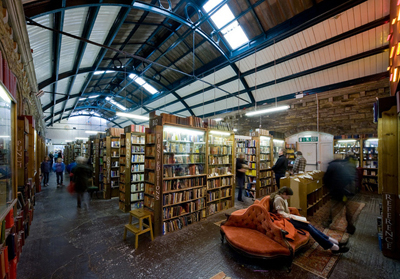 "Bookshops are a traveller's best friend: they provide convenient shelter and diversion in bad weather, they're a reliable source of maps, notebooks, and travel guides, they often host readings and other cultural events, and if you raced through your lone paperback on the first leg of your trip, the bookshop is the place to go for literary replenishment. - Lonely Planet. BOOKSELLING is the commercial trading of books, the retail and distribution end of the publishing process. People who engage in bookselling are called booksellers or bookmen. BOOKSTORES may be either part of a chain, or local independent bookstores. Bookstores can range in size offering from several hundred to several hundred thousands of titles. They may be brick-and-mortar stores or internet only stores or a combination of both. 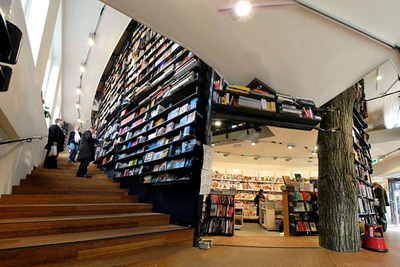 Sizes for the larger bookstores exceed half a million titles. Bookstores often sell other printed matter besides books, such as newspapers, magazines and maps; additional product lines may vary enormously, particularly among independent bookstores. Colleges and universities often have their own student bookstore on campus that focuses on providing course textbooks and scholarly books, although some on-campus bookstores are owned by large chains such as WHSmith or Waterstone's in the United Kingdom, or Barnes & Noble College Booksellers in the United States, which is a private firm controlled by the chair of Barnes & Noble. Another common type of bookstore is the used bookstore or second-hand bookshop which buys and sells used and out-of-print books in a variety of conditions. A range of titles are available in used bookstores, including in print and out of print books. 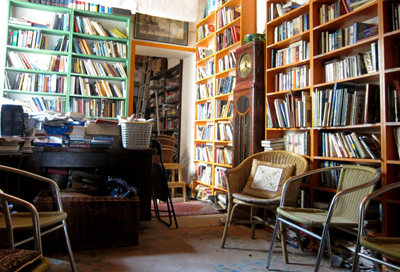 Book collectors tend to frequent used book stores. Large online bookstores offer used books for sale, too. Individuals wishing to sell their used books using online bookstores agree to terms outlined by the bookstore(s): for example, paying the online bookstore(s) a predetermined commission once the books have sold. In Paris, the Bouquinistes are antiquarian and used booksellers who have had outdoor stalls and boxes along both sides of the Seine for hundreds of years, regulated by law since the 1850s and contributing to the scenic ambience of the city. 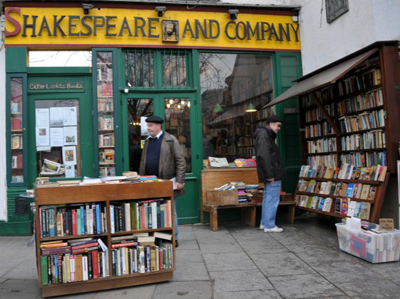 10 best independent bookshops in the world - The Guardian. 10 of the world's most beautiful bookshops - BBC Culture. 12 Of The Biggest Bookshops In The World For When You Want To Lose Yourself In Literature - Bustle. 16 of the world's most beautiful bookshops - The Telegraph. 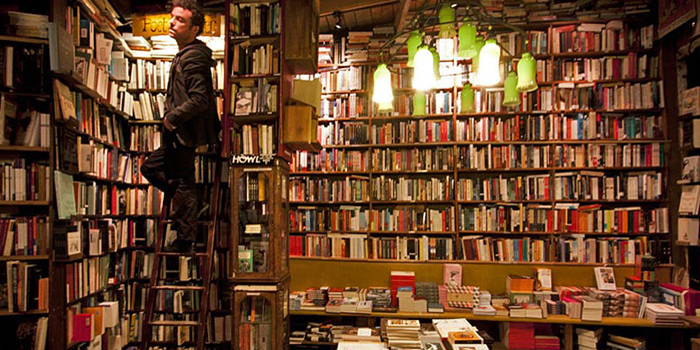 20 Most Beautiful Bookstores in the World - Flavorwire. 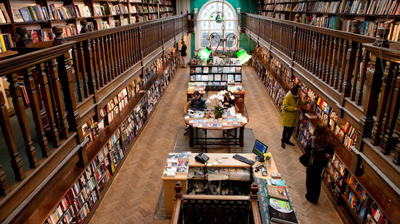 22 most beautiful bookshops in the world - Skyscanner. 44 Great American Bookstores Every Book Lover Must Visit - BuzzFeed. 50 Best bookshops - The Independent. 50 Of The Best Indie Bookstores In America - HuffPost. 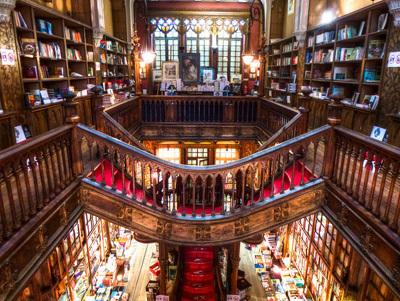 Europe's 10 Most Beautiful Bookstores - Culture Trip. The best bookshops in London for book lovers - Time Out. 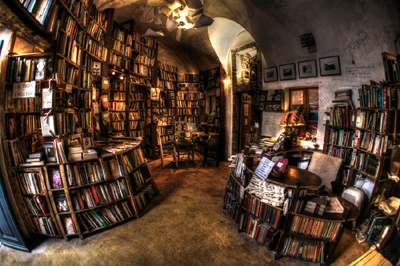 world's greatest bookshops - Lonely Planet. 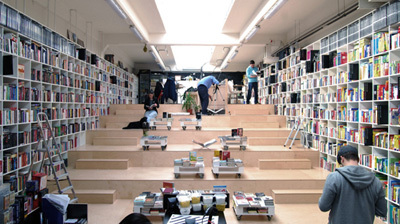 7L BOOKSHOP - 7, rue de Lille, 75007 Paris, France. Created by Karl Lagerfeld in December 1999. Specialized in art and photography, fashion, design and interior architecture and architecture. ADRIAN HARRINGTON - since 1971. Rare books; rare first editions; leather bound sets and general antiquarian. "We specialise in all aspects of the literary James Bond, including Ian Fleming and the official 'continuation' authors in hardback and softcover, their periodical and magazine appearances, proof copies, letters, documents, artwork and other signed material." 64a Kensington Church Street, Kensington, London, England, U.K.
Another Country - Kreuzberg, Berlin, Germany. Another Country is an English Language second hand bookshop which is mostly used as a library. They have about 20.000 books that you can buy or borrow. You simply pay the price of a book, which you get back, minus a 1.5 Euro charge, should you choose to return it. Another Country is also a club which hosts readings, cultural events, social evening, film nights and many other things. Gridskipper said: "In no particular order, Another Country is a secondhand bookshop, library, and subculture -- blogosphere and subculture events included. Alan Raphaeline, a marvelously outré Briton, is the gunslinger behind this highly-spirited and diversified place. The best way to experience Another Country is simply to arrive and allow its orb to swallow you whole. A word of advice: Leave your ego and Harry Potter inquiries at the door." ASPREY - "The Asprey Fine and Rare Book Department offers an eclectic range of first and limited editions dating from the 17th century to the present day." 167 New Bond Street, London, England, U.K.
Atlantis Books - Oía, Santorini, Greece. Atlantis Books is an independent bookshop on the island of Santorini, Greece, founded in 2004 by a group of friends from Cyprus, England, and the United States. We have fiction and non-fiction in Greek, English, Spanish, Italian, German, French, and two shelves of Dutch. Throughout the year we host literary festivals, film screenings, book readings, and good old fashioned dance parties. BARNES&NOBLE - 555 Fifth Avenue, New York City, NY 10017, U.S.A. A Fortune 500 company, is the world’s largest bookseller and the nation’s highest rated bookselling brand. 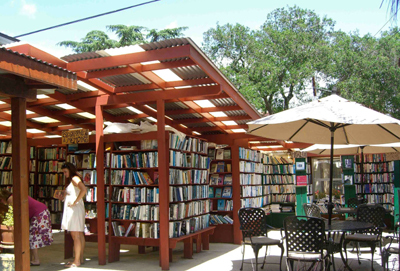 Bart's Books - Ojai, California, U.S.A. "The World's Greatest Outdoor Bookstore." Bookstore founded by Richard Bartinsdale in 1964. It is a (mostly) outdoors bookstore, and some books are available for sale at all hours. Shelves of books face the street, and patrons are asked to drop coins into the door's coinbox to pay for any books they take whenever the store is closed. Barter Books - Alnwick, England, U.K. Second-hand bookshop located in the historic English market town of Alnwick, Northumberland owned and run by Stuart and Mary Manley. It has over 200,000 visitors a year, 40% of whom are from outside the area, and is one of the largest second-hand bookstores in Europe. It is considered a local tourist attraction and has been described as "the British Library of second-hand bookshops." 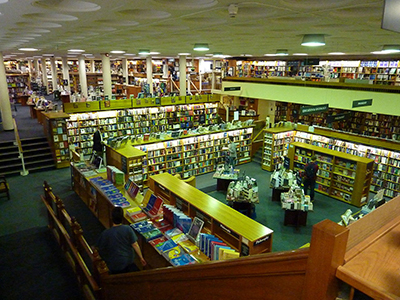 Blackwell's Bookshop - flagship branch: 48-51 Broad Street, Oxford, England, U.K. Backwell's is an institution in Oxford. Founded by Benjamin Henry Blackwell, the son of the first city librarian, in 1879. The shop was initially only twelve feet square, but quickly grew to include space upstairs, in the cellar, and neighbouring shops. It is now Oxford's most famous and leading bookshop, with other specialist branches elsewhere in Broad Street and Oxford. 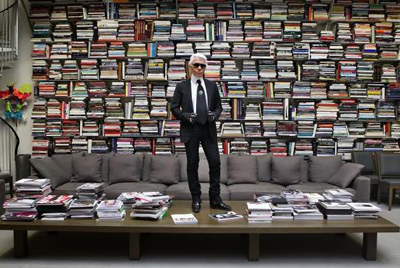 It has the largest single room devoted to book sales in all of Europe (the 10,000 sq. ft. Norrington Room). BookÀbar - Rome, Italy. 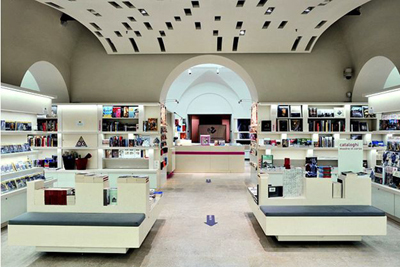 In cool, gleaming white rooms designed by Firouz Galdo, Arion Esposizioni – the bookshop attached to Palazzo delle Esposizioni – is just made for browsing. There are books on art, architecture and photography, DVDs, CDs, vinyl, children’s books and gifts for the design-lover in your life. CafebrerÍa El PÉndulo - Mexico City, Mexico. Not only the bookstore in your urban city which can be three-in-one, this bookstore can too, because other than as a bookstore, Cafebrería el Péndulo also providing Bar And Café. The visitors can read books, eat food, also can enjoy the clean air produced by various types of plants decorated in the bookstore. 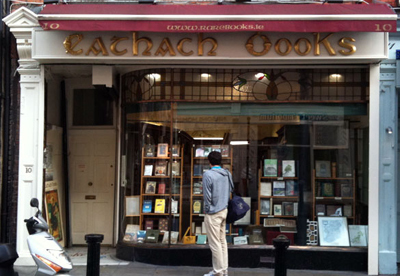 CATHACH BOOKS - Dublin, Ireland. Since 1969 Dublin's leading antiquarian bookshop, located on Duke Street in Dublin's city centre. Our particular specialty is in 20th century Irish literature. We have an unrivalled selection of rare Editions by James Joyce, Oscar Wilde, W.B. Yeats, Samuel Beckett, Seamus Heaney, Brendan Behan, Flann O'Brien and many others. We also stock a wide variety of books on Irish history and topography from the 17th Century to the recent past. 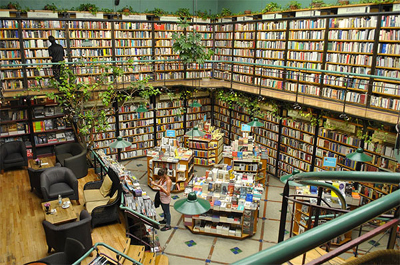 City Lights Bookstore - San Francisco, CA, U.S.A. Founded in 1953 by poet Lawrence Ferlinghetti and Peter D. Martin (who left two years later). Specializes in world literature, the arts, and progressive politics. 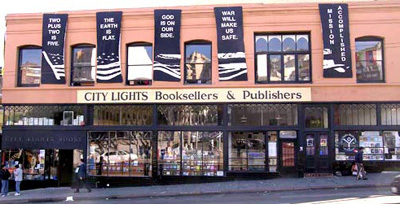 In 2001, the San Francisco Board of Supervisors made City Lights an official historic landmark - the first time this had been granted to a business, rather than a building - citing the organization for "playing a seminal role in the literary and cultural development of San Francisco and the nation." It recognized the bookstore as "a landmark that attracts thousands of book lovers from all over the world because of its strong ambiance of alternative culture and arts". Cook & Book - Brussels, Belgium. There is a whole separate English section (decorated as an oldschool British library/gentlemen's club) as well, which is almost a must for most bookstores in a city like Brussels. The interior design of the bookstore deserves a special mention as it is nothing short of unique. The interior architects had a huge space to work with and they created nine autonomous spaces, each with its own character and atmosphere. There's even a terrace where you can read or eat or both, as well as a small playground for the children. 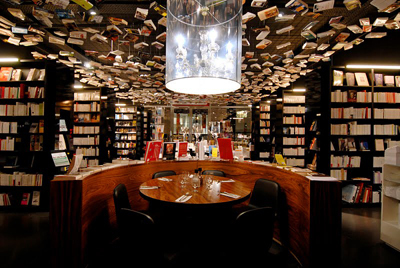 Corso Como Bookshop - Milan, Italy. Extensive selection of publication on art, architecture,. design, graphics and fashion,. with a strong emphasis on photography. Shopping and dining complex in Milan, Italy. It combines outlets that show and sell works of art, fashion, music, design, cuisine and culture. It was founded in 1990 in Milan, Italy, by gallerist and publisher Carla Sozzani. Daikanyama T-Site - Tokyo, Japan. In a perfect world, all bookshops would be like this. Tokyo's Klein Dytham Architecture won an award at the World Architecture Festival for their work on Daikanyama T-Site, which is spread across three interlinked buildings adorned with lattices of interlocking Ts. That 'T' stands for rental chain Tsutaya, whose seemingly bottomless pockets helped fund the kind of book emporium that most capital cities can only dream of. It's easy to lose hours thumbing through the selections here, which include a good range of English-language titles, art books, antique tomes and magazine back issues. (TimeOut Tokyo). Daunt Books - London, England, U.K. "Daunt Books is an original Edwardian bookshop with long oak galleries and graceful skylights situated in Marylebone High Street, London. We also have shops in Chelsea, Holland Park, Cheapside, Hampstead and Belsize Park." DUSSMANN DAS KULTUR KAUFHAUS - Berlin, Germany. El Ateneo - Buenos Aires, Argentina. Situated at 1860 Santa Fe Avenue in Barrio Norte, the building was designed as a theatre called Teatro Gran Splendid in May 1919. The ornate former theatre was leased by Grupo Ilhsa in February 2000. 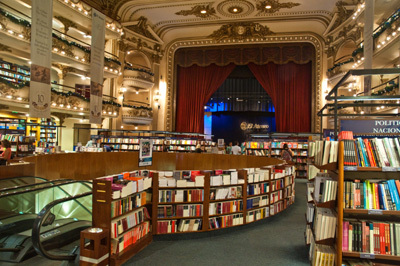 Ilhsa, through Tematika, owns El Ateneo and Yenny booksellers (totaling over 40 stores), as well as the El Ateneo publishing house. The building was subsequently renovated and converted into a book and music shop. The building still retains the feeling of the grand theatre it once was. 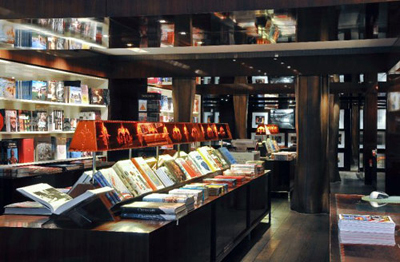 The Guardian, a prominent British periodical, named El Ateneo second in its 2008 list of the World's Ten Best Bookshops. Over a million people walk through its doors annually. 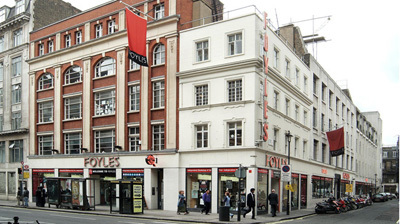 FOYLES - London, England, U.K. Once listed in the Guinness Book of Records as the world's largest bookshop in terms of shelf area (30 miles/50 kilometres) and number of titles on display. In the past, it was famed for its anachronistic, eccentric and sometimes infuriating business practices; so much so that it was a tourist attraction. It has since modernised, opened new branches and established an on-line store. 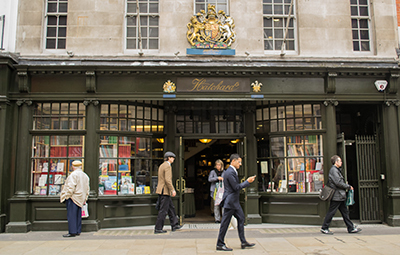 HATCHARDS - booksellers since 1797. Royal Booksellers. 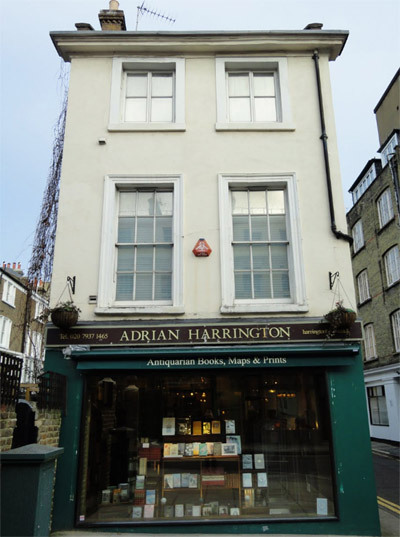 London's oldest bookseller. 187 Piccadilly, St. James's, London W1J 9LE, U.K.
Heywood Hill London Bookstore Behind Some of the Very Best Libraries - curates impressive collections for discerning customers in 60 different countries — and specializes in the obscure. La Maison des Amis des Livres - (1915-1951). Owned by Adrienne Monnier (1892-1955) who was a French bookseller, writer, and publisher, and an influential figure in the modernist writing scene in Paris in the 1920s and 1930s. 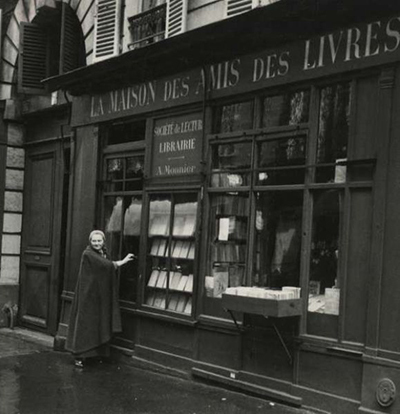 On 15 November 1915, Monnier opened her bookshop and lending library, "La Maison des Amis des Livres" at 7 rue de l'Odéon, Paris VI. She was among the first women in France to found her own book store. Monnier offered advice and encouragement to Sylvia Beach when Beach founded an English language bookstore called Shakespeare and Company in 1919. During the 1920s, the shops owned by Beach and Monnier were located across from each other on the rue de l'Odéon in the heart of the Latin Quarter. Both bookstores became gathering places for French, British, and American writers. By sponsoring readings and encouraging informal conversations among authors and readers, the two women brought to bookselling a domesticity and hospitality that encouraged friendship as well as cultural exchange. Lello Bookstore - Porto, Portugal. Since 1881. One of the oldest bookstores in Portugal. In 2011, the travel publishing company Lonely Planet classified Livraria Lello as the third best bookstore in the world. Ler Devagar - Lisbon, Portugal. 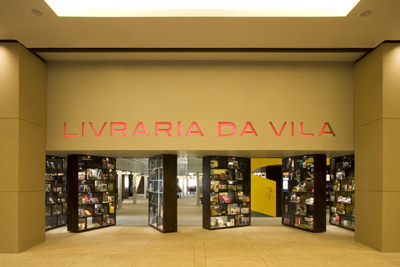 Ler Devagar (literally, "read slowly" in Portuguese) is a bookstore and more. First, it is located in the LX Factory, a building built in 1864 to manufacture thread and fabric. The machinery has been moved out, and the large open factory spaces have become a mecca for the Lisbon creative sector. Advertising agencies, designer workshops and art galleries now fill the space. It is the ideal location for a bookstore hoping to expand the minds of its customers. Ler Devagar stocks a large selection of books across two floors of space. Arts and culture are heavily represented here, as are books in many foreign languages. An art gallery is upstairs. There is also space for book readings and lectures. Cozy up to your new book with a cup of tea from the industrial bar. Librairie la Hune - 16-18, rue de l'Abbaye 75006 Paris, France. LIVRARIA DA VILA - São Paulo, Brazil. A real paradise for book lovers! Every corner of this fantastic bookstore invites shoppers to spend time reading and exploring. LONDON REVIEW BOOKSHOP - London, England, U.K.
MÁL & MENNING - Reykjavik, Iceland. Ofr. - 20, rue Dupetit-Thouars, 75003 Paris, France. 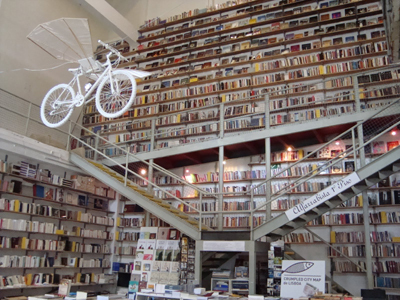 Plural Bookshop - Bratislava, Slovakia. The stairs function as reading and display area. Wall-to-wall bookshelves and simple, clean design. Selexyz Dominicanen Bookstore - Maastricht, The Netherlands. 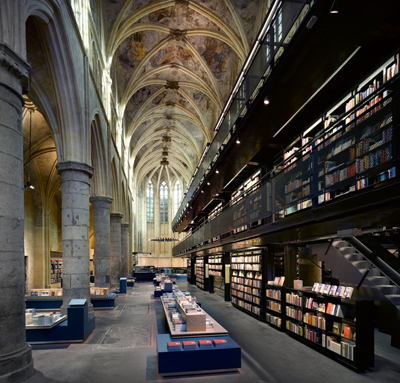 Holland's most sacred bookstore: occupying a 13th-century Dominican church, Selexyz Dominicanen consists of a steel bookstack rising towards the heavens. Cunningly, this both leaves the nave’s grandeur intact and creates 1,200 sq metres of selling space – despite the 750-sq-metre floor area. Staircases and a lift lead to the top of the three-storey stack, where you can eyeball 14th-century ceiling paintings. The altar has been superseded by a café, with a halo of lights hanging above a cruciform table. It’s an award-winning architectural triumph and a peaceful haven for page thumbing. SHAKESPEARE & COMPANY - 37, rue de la Bûcherie, 75005 Paris, France. Opened in 1951 and serves both as a regular bookstore and as a reading library, specializing in English-language literature. SLIGHTLY FOXED - London, England, U.K. "A World of Reading." STRAND BOOKSTORE - New York City, NY, U.S.A.
Taschen - 2, rue de Buci, 75006 Paris, France. 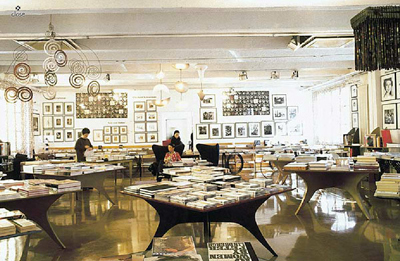 This bookshop is a real treasure trove, founded by Philippe Starck, where the exclusive selection of books on painting, cinema, photography and eroticism attracts lovers of rare objects. From “Icons” collections at 6.99 euros to “Collectors” editions of numbered books, sometimes signed by their authors at 10,000 euros, Taschen only offers exclusive items, thus pleasing collectors as well as the curious. An unmissable place to be in style. The American Book Center - Amsterdam, The Netherlands. The American Book Center, or simply the ABC, is actually much more than a bookstore and it plays an important role in the promotion of English literature and language in the multicultural city of Amsterdam. This bookstore has a long tradition in Amsterdam, and in 2006 it has moved to a new location - a three hundred year old building in the center of the city. The ABC's three floors are ready to satisfy the needs of even the more exigent readers. Actually, the ABC is often stated as the biggest American bookstore in continental Europe. The Bookworm - Beijing, China. A bookshop, library, bar, restaurant and events space, now with four locations in three cities – Beijing, Suzhou and Chengdu. 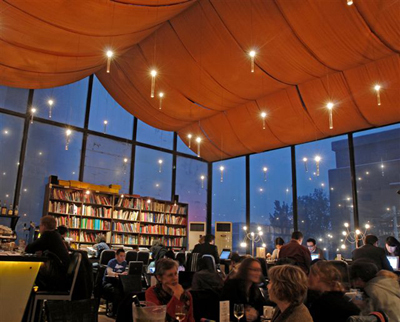 "It’s easy to see why The Bookworm is such a hit among Beijingers; where else can you while away the hours savouring fabulous fare, browsing thousands of books, sipping good espresso, being regaled by eminent authors, catching up with friends over your favourite tipple, or simply just checking your emails? The spacious, interconnecting rooms with floor-to-ceiling books on every wall are light and airy in summer, yet cosy and snug in winter. And the roof terrace is perfect for yard-arm cocktails." The Last Bookstore - Los Angeles, CA, U.S.A. The Last Bookstore occupies a space that used to be the main floor of Crocker National Bank -- a major financial institution when Spring Street flourished as the "Wall Street of the west" in the 1920s. Upon entering, the ceiling towers above and grand marble columns transport you back to a time when Los Angeles' wealthiest men and women entrusted their millions inside these walls. On the ground floor, bestsellers and beautiful coffee table books mingle with a record section and a coffee bar. There's also a raised stage where events like readings and book signings take place. (The Huffington Post). THE MYSTERIOUS BOOKSHOP - New York City, NY, U.S.A. "The World's Finest Mystery Specialty Store. Offering the best in Mystery, Crime, Suspense, Espionage & Detective Fiction." W.H. SMITH - over 550 High Street stores and 440 Travel outlets at airports, train stations, hospitals and motorway service areas. World's Biggest Bookstore - Toronto, Ontario, Canada. Owned by Indigo Books and Music. 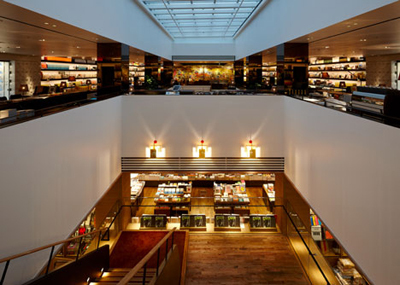 The three storey store covered 64,000 square feet and is noted for its bright lights and over 20 kilometres of bookshelves. At the time of its opening in 1980, in a converted bowling alley, it was unchallenged in its claim as the biggest bookstore in the world. 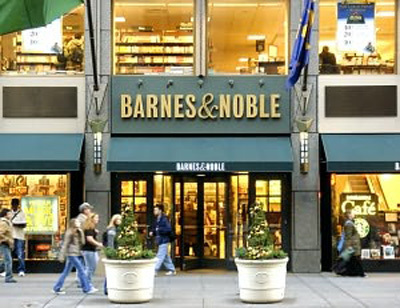 Although it retains the name today, the Guinness Book of World Records lists a Barnes and Noble outlet in New York City as the world's largest bookstore based on floor space, although Powell's Books of Portland, USA is usually considered the largest based on shelf-space. Nevertheless, World's Biggest Bookstore still claims the title on the basis that it depends on how "biggest" is defined: while Barnes and Noble has more floor space, World's Biggest Bookstore carries more titles.